Third class passengers on the Manchester And Leeds Railway in the 1840's. "The Yorkshire & Lancashire Railway"
I remember going to Manchester to see my grand­father in 1845. I left Thornhill Station, which at that time was the only railway station for Dewsbury. I travelled in a passenger wagon train in a stand-up carriage. 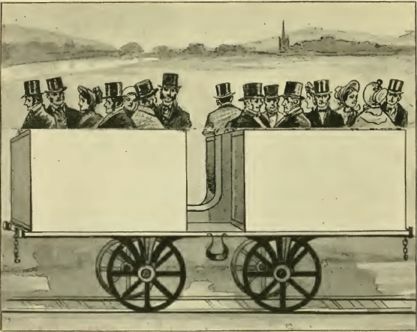 This carriage was simply a square wood box or wagon, without seats or roof, exposed to all sorts of weather, and the passengers all wedged in, like cattle in a truck. Of course, going to see my grandfather, I must go in my Sunday clothes, and had on a new top hat. To my surprise and sorrow, on emerging out of Summit Tunnel, I found my new hat entirely spoilt, the down being frizzled up by the small hot cinders emitted from the funnel of the engine. I arrived at Manchester about noon. On my return home I again travelled by train in a stand-up box from Manchester to Thornhill, in a down­pour of rain the whole of the journey. This and the previous frizzle completely put an end to my brand new hat. In those days people were not so well educated in extortionate habits, otherwise a claim would have been made for a new hat upon the railway company. Since then the railway companies have progressed marvellously in providing comfort and facilities for the travelling public, particularly in third-class accommodation. When the line was first opened the third class were called wagon passengers, and porters were not allowed to assist them in any way with their luggage. If they were not at the booking-office window ten minutes before the train was due, the clerk had instructions not to book them.